A front porch is the first experience anyone gets of your home and recently we gave ours a mini makeover! 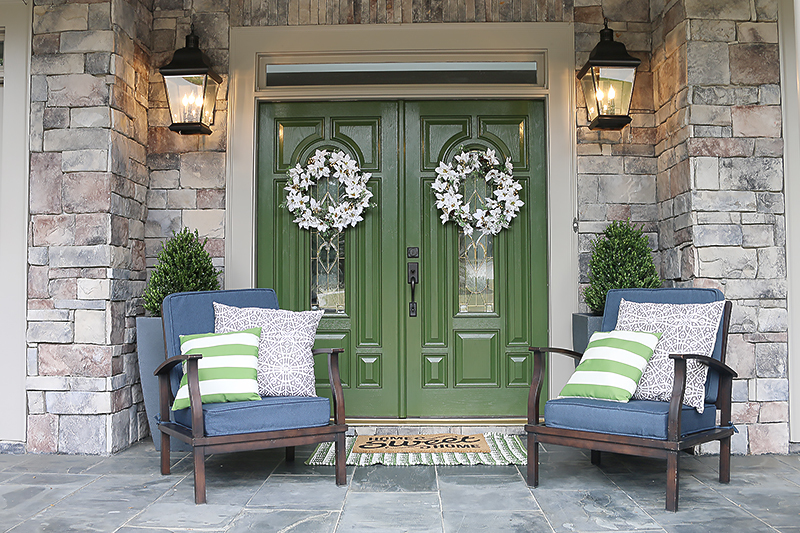 With this fresh new look, we are guaranteed a first-impression rose 🙂 This makeover is so easy and we are so happy to share our recipe for a welcoming front porch. If you are looking to spruce up your entry or are looking for a new house, you can see what a huge difference one short afternoon can make. Just check out this after…. Interested in the easy steps? We made this fun video to show you how! And thanks to The National Association of Realtors for making this fun video happen. Check out more home improvement tips and money saving improvements on their HouseLogic site! Great update with the door color. I don’t understand putting chairs in front of the planters though, the planters add that perfect touch without the chairs. Maybe putting the chairs to the side in front of one of the sets of windows with a small table between, to give the seating desired. Just not right in front of the door. I’ve seen this many times in my area, but only when it is a townhouse, or very small porch space. You have ample porch space to fit chairs elsewhere. Just my opinion. I love the green front doors. However, I think the chairs are a major miss in this makeover. They make the entry seem awkward and cluttered and the access to the actual doors blocked. It looked great before you added them. Normally I love your style, but this just feels like it was adding stuff to add stuff and it’s totally impractical from a functional and anesthetic standpoint. What bush is that in the planter? I have asparagus fern in ours right now but I want something with more height. Cute! Where are those planters from? I like the pretty green color, will you share the color name and brand? I do have one concern though, the rug outside the door looks like it could be a tripping hazard since the edges are not down flat. They may seem weird but in real life they aren’t. It actually is a really big porch and space is too big without them. It feels cavernous! At Home! Saw them and loved the shape and size! Jumping on the “alternative facts” bandwagon, Katie? Where is the cotton rug used to layer under the doormat from? I am looking for a nice neutral layering rug on the cheap. Maybe you could do a post about how to layer entry rugs? Thanks! I’m just curious – where did you get the “Home Sweet Home” rug? I love it! Love the green. Looks great. Adorable video. Target! It was from last season and I got it for under $10. I’m sorry. I have no idea what that means. (I’m sure I could google but I’m feeling lazy) I am just saying that in photos, we have to take them at a lower angle so that we can get far enough back (at that angle the chairs block more of the planters) but in real life the viewing angle makes everything feel spacious and ‘right’. Does that make sense? I got it at At Home. It is really a great thing to get a rug for the upper layer that has words or something graphic like a monogram. The base layer we realized needs to be at least 50% bigger and a smaller pattern works best! I also don’t understand the chairs being in the walkway. It makes it seem cramped and cluttered. As a design student, one of the major things we are always taught is to make sure the walkway is clear and easy to maneuver through. I would recommend putting the chairs to the side with a table in between like another commenter suggested. If it makes the entry seem too large then get larger plants for the planters, get a bigger rug etc, but I think having a big open space in front of an entry is more inviting than having two chairs blocking your path. Hi Katie and Jeremy, did you do prep work to your door like sanding it? Can I just paint directly over the existing paint? Love your video! I’d like to see a wide shot of the porch. Those chairs are throwing me off. Where oh where did you get the chairs from?? I love them, and think they are perfect for the space!!! You should also google “Richard Spencer punch” if you’re behind on current events. Wild times we’re living in. It has plenty of room for a single person. And that’s all we need 🙂 Obviously everyone is different…but this is how we like it. The chairs are from Lowe’s 🙂 They are kinda old but I know they sell things similar at most home improvement stores during the summer months! Yeah. Sorry. Didn’t get it. And it’s a well known fact that I’m always behind on current events! haha! I love the green! To me, the chairs cut off the entry and feel unwelcoming. What a difference the paint makes. Love that color green paired with the blue. I also just realized that we have the same exact front door. Now to make my front porch look as welcoming as yours. Thanks for the inspiration. Good grief you guys are cute!!!! Love love love your bloopers in your videos. 🙂 they make me smile every time. But yes the booger…. gross and oh so typical mom of little ones to have pulled it off… lol! Love the green doors, I took my favorite throw pillow to the hardwear store and had a little sample size jar of paint matched to the pillow and now my front door is golden yellow. i tend to change my mind and change to color every year or two. Sample jar is under five bucks and in a day you get a whole new look! Thats me too! I have had it red, black and green…what’s next right?! A great paint is “Modern Masters – Front Door Paint” It is made specifically for doors ~ won’t fade…. covers nicely. I ordered it online and it came in 2 days. You will only need one container. I loved the color I chose (Tranquil) so much ~ I painted the inside door that color too. What color paint did you use on the doors? I forgot the swatch name – I will look and let you know when I get back home! I think the chairs are just a different touch some may like and some may not, personal preference. At first I was thinking they may be too much but then they grow on you, I can imagine sitting in them on a nice hot day. I have to speak on this alternative facts crap…. She is clearly saying that the video/picture doesn’t capture the full look of the porch and in person the chairs make more sense, she didn’t avoid the question and this is a article on decorating not political opinions smdh. Can you please please email me the color/brand you selected for the door and how much paint you needed? I’ve been wanting to paint our door and have just been scared but this really grabbed me! I want to start now!!! !